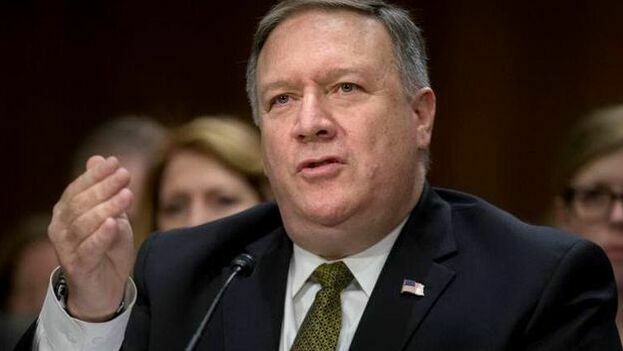 14ymedio/EFE, Havana, 4 March 2019 — The Donald Trump Administration announced Monday that it will allow trials in US courts against those companies sanctioned by Washington that operate in Cuba and that are included in a “black list,” according to statements by Secretary of State Mike Pompeo. However, for the rest of the companies, the US has renewed the suspension of Title III of the 1996 Helms-Burton Act and will not allow, for the time being, suits before the courts for doing business with the properties confiscated after the takeover by Fidel Castro in 1959. The US black list includes entities that are “under the control” of Cuban intelligence services and the Armed Forces, as well as personnel that establish “direct financial transactions” that could harm the Cuban people, as explained by the Department of State on its website. This includes the ministries of the Revolutionary Armed Forces and the Interior, as well as a large number of hotels, such as the Cuban chain of Gaviota tourist establishments and the facilities of that group, such as the Varadero Meliá Marina, managed by a Spanish company. Since its creation in 1996, Title III of the Helms-Burton Act has been suspended by all US administrations every six months; but, in January, when it was time to extend this situation, the Trump Administration set off all the alarms when renewing the suspension for 45 days instead of the usual six months. On Monday, Washington has renewed the suspension for only 30 days, until April 17, but has decided to create some exceptions and apply Title III of the Helms-Burton to some companies now. These exceptions could affect Russian and Chinese companies that have invested in Cuba. “Cuba’s role in usurping democracy and fomenting repression in Venezuela is clear. That’s why the U.S. will continue to tighten financial restrictions on Cuba’s military and intel services,” White House National Security Advisor John Bolton said on Twitter on Monday. All US presidents have frozen this provision in the last 23 years, partly to avoid opposition from the international community and also out of fear of an avalanche of cases in the United States judicial system. The complete lifting of the ban could allow billions of dollars in lawsuits to advance in US courts and probably face opposition from European partners and Canada, whose companies have significant stakes in Cuba. The measure is a blow against the attempts of the Cuban authorities to attract more foreign investment and could harm some US companies that have begun to invest in the Island after the diplomatic thaw initiatied by former president Barack Obama. Washington is also considering imposing more financial restrictions on Cuban military personnel, according to Reuters.